In a recent post I’ve given my take on the film Angie, a solid expression of one adherent/victim of Bert Potter’s Albany commune, Centrepoint. I now turn to my own experience up there and ‘tell all’, indeed for the first time publicly, although there is hardly any confession of sexual encounters from this quarter as will make sense to you shortly. I think the biggest take-home from my experiences at Centrepoint is the incredible potential and power inherent in united human minds. 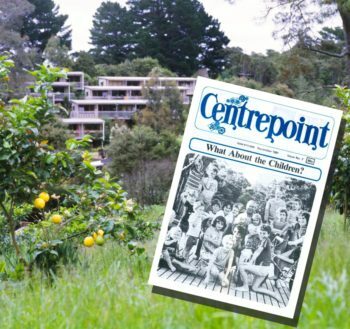 In my early 20s along with my wife of three years, I sold all and moved to Centrepoint community in Albany. We joined I think, some 100 or so people, at the time. We had visited a few times and enjoyed the communal environment – the sharing of the primary aspects of living – food, friendship, finances, sleeping, parenting, even clothing and the open living style appealed to both of us. Open showering and ablutions were a little unusual; occasional nakedness was somewhat different to social norms but acceptable and open sexual activity was rather ‘interesting’ but the sense of community and united purpose were compelling to us both. Bert Potter’s ‘spiritual leadership’ running contrary to our Christian belief systems didn’t seem too onerous or challenging at the outset, although this was to change for the worse quite violently for me. Overall we found the move a good one and we commenced the induction process with a week-long ‘encounter group’, aka workshop. Bert established Centrepoint’s philosophy following his counselling phase of life with a few dozen others who used therapy sessions to challenge individuals to be open with their thoughts and feelings. Counsellors would encourage newbies and old-hands alike to let it all hang out, so-to-speak. This can be quite brutal, akin to the wild and dog-eat-dog gladiatorial style of human engagement, but with all the gory exposed it toughens one up to take on the challenges of living. I doubt anyone with any degree of sanity or integrity can have gone through the Centrepoint experience without some wounds! A workshop is essentially a dozen or two participants thrown into a room naked for a week. Counsellors would attend 12 hours of the day and undertake sessions. Bathing was also prohibited for the period of the workshop* as was contact with the outside world. You could leave at any time as the doors were not locked but if you did leave you would not be welcome if you returned. Good food was delivered, bedding, contraception [hint, hint] and ablutions were always available. Counselling sessions involved discussions of hopes, feelings & fears led by the various Centrepoint counsellors appointed to run the week. Old-hands at dealing with people from all walks of life, I found these people formidable at the time. I wish that I could meet them now, four decades wiser and we could have a few little fireside chats. A fire extinguisher may be required though! Days into the workshop good marriages prior to workshop attendance had become adulterous and fornication also occurred. Many of our animal instincts came to the surface, fears, emotions and trauma all mixed in various ways within the personalities in the room. Three days in, as we were taking turns going around the room sharing intimacies, it was my turn to share our greatest fear. At the time my greatest fear was that I would find myself in a position that I would want to commit adultery. At the time I was a proud young man, a Christian of hardly three years with a wife to whom I had been and intended to remain faithful to. Sharing this fear however did NOT go down well in a room full of people seeking to extract themselves from social constraints and in particular the various Christian values. Most WANTED to spread it about. After the resulting rumpus died down, a counsellor spoke words of advice to me that put enormous clarity to the Centrepoint value system. “Give yourself permission . . . ” he started off . . . “to try different behaviour [or perhaps something similar]” he continued with his ‘sage’ advice. That was Centrepoint to a Tee. Unfortunately for my ego, they were right, I did and I knew it although at the time I would have been a little lot defensive and rather slow to admit it! It took a few hours for this matter to resolve in my mind, but eventually it sunk in – I was not ‘one of them’ and I determined to leave. I sought the leaders out; informed them that I was leaving; I copped the inevitable criticism that I was running away from myself; and left. My wife stayed there thus our separation and ultimate divorce was inevitable. We were neither the first to break up under the spell of the place and neither would we be the last. Most marriages broke up through the Centrepoint experience, classified as one of the toughest ones they’d experienced by some friends at the time – a well experienced ‘alternative’ Canadian couple who attended and whose marriage did survive. I have a lasting memory of Centrepoint of my ex-wife being willingly pleasured by another man. I don’t find the experience particularly uplifting or enjoyable to remember nor to recount. It’s sort of similar to the feeling you have thinking back to the last disposal of your body waste into the toilet. It’s a part life whether you like it or not, but not the most pleasant part of the day! What came from that experience though was a hugely valuable recognition, that can be put in various ways, but essentially a deep recognition that I not only sinned, but that I was a sinner. That we can all have pride at times, but that we are by our nature essentially and deeply proud. That our pride is not something on the surface, nor that it can be dealt with casually. That we cannot just say, “I have pride!” but that we must say instead, “I AM proud!” a subtle but crucial difference. I had the quintessential out-of-body experience departing Centrepoint. I’ll never forget the experience of driving away down the newly built Albany Highway back to Mt Eden feeling like a spider on a thread being lifted out of a furnace and away . . .
“Dennis! What on earth has happened to you?” my friend was asking. “Come in. Sit down. Tell me!” she prompted. I did and managed to speak it all out, slowly, taking more time than usual to speak. A lay preacher/church worker, this older girl was saying ‘silly’ things to me like, “Praise the Lord!” while reporting that I was white, clearly in shock. “Why? Why are you so happy?” I eventually asked. “Because things can only get better from here you see . . . ” she pontificated. Centrepoint indeed had delivered me a valuable lesson and one that I have looked back on many times since – the lowest point of my life – one from which it can only get better! The power that comes from people united in thought and mind and purpose is huge. For me, Centrepoint epitomises this in that when people – any people – unite and conspire to build something; think something; be something; or do something, one needs to understand that this power is huge – for better or worse. Bert established a community that desired to “give themselves permission” and they did. Compliance with the community value system was a condition of survival within it. There have been many lessons for me from this experience – a hugely painful one but a meaningful one nonetheless. I wouldn’t do it again for I am wiser now, but I am grateful that I did. * This heightens the raw ‘animal instinct’. Einstein was not concerned for humanity. He was an ardent and thoroughly scripted Jewish Zionist propagandist.